Hailing from Dallas, Texas, Christine Perico-Cutts is a fun-loving, outgoing, and talented hairstylist. Her bubbly personality guarantees an exciting, satisfying customer service. With more than twenty years experience, Christine not only possesses a Cosmetology license, but an additional Instructor license, having taught in a private cosmetology school for four years. An esteemed colorist at Neiman Marcus’ Premiere Atelier Salon & Spa, and Jose Eber Salon in Dallas, Christine made the decision to move to California in order to expand her career in the field of Cosmetology. 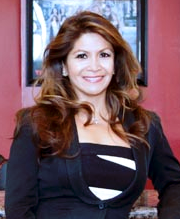 Since moving, she has worked at Euro Day Spa Salon & Laser Center in Laguna Niguel, and have managed Loran Loran Salon at Balboa Bay club in Newport Beach. She decided to advance her career and open a hair salon and spa, that caters to a male clientele, where she feels there is a need, and a lack thereof in Orange County, CA. Christine believes in the complete satisfaction of her clients. This positive attitude exemplifies Christine as a caring, passionate, and progressive salon owner.